Did you know that before development of dental implants, dentures were the only alternative to replacing a missing tooth or teeth? Not everyone in Bowie is a candidate for a dental implant, however. For a successful implant to take hold, you must have proper bone density and have a strong immune system. In all cases, dental implants require strict oral hygiene. 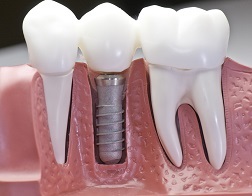 Because implants require surgery, patients are administered anesthesia and, if necessary, antibiotics to stave off infection following the procedure. Like any restoration, dental implants require diligent oral hygiene and proper care to ensure they last a long time. For more information on dental implants in Bowie, MD or to make an appointment call Omni Dental Group at (301) 809-0029 today!